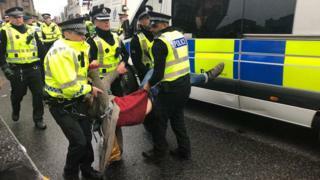 Police made 29 arrests as about 300 climate change protesters blocked one of the main roads into Edinburgh's city centre. Supporters of Extinction Rebellion Scotland targeted North Bridge as part of the International Rebellion, which has taken place in a number of cities. A "critical mass" bike ride began the Edinburgh protest at 14:00, with cyclists coming from around the city. The bridge occupation, which caused long tailbacks, lasted until 21:00. Organisers said they wanted to disrupt "business as usual" and highlight the "climate and ecological catastrophe unfolding across the globe". Groups of cyclists converged on North Bridge from Fountain Park Canal Basin, John Hope Gateway, Middle Meadow Walk and Duncan Place Leith Links. The aim was for the cyclists to slow the traffic before stopping it altogether. Richard Dyer, of Extinction Rebellion Scotland, said they were taking "peaceful direct action". He said: "I am not advocating violence. We have to do all we can to bring this serious problem to the attention of the world, and if that means that I run the risk of being arrested and fined, then so be it." On Monday, Extinction Rebellion Scotland dropped banners over Victoria Street in Edinburgh, from the Finnieston Crane, and across Glasgow's City Chambers. No-one was arrested. In London, however, protests caused widespread disruption on Monday, and campaigners have now been ordered to restrict their protests to Marble Arch. The Metropolitan Police said 500,000 people had been affected by the diversion of bus routes. By 21:30BST on Tuesday 290 people had been arrested.